Exhibition // Lada Nakonechna: The music stops. The guests are embarrassed. Pause. Lada Nakonechna’s Die Musik bricht ab. Die Gäste sind verlegen. Pause. (The Music stops. The guests are embarrassed. Pause.) is an unusual spectacle with interesting character roles at the heart of the production. These certainly tickle a reaction out of an audience, once they’ve found the thread in the story. In short, the show is a mix of different objects and constructs with elements taken from the real as well as the digital world, referencing war and conflict, media manipulation and personal prejudices. However, when entering Eigen + Art gallery in Berlin Mitte, the Ukrainian artist’s intention does not become immediately clear. She was, herself, reminded of a theatre setting when first stepping inside the space. With its tall white walls and a set of steps reminiscent of a stage exit between the entrance and the exhibition space, the gallery was playfully altered by Nakonechna, hiding the ceiling light under a zero degree photoshop banner. Strong references to the epic theatre, a term coined by Bertold Brecht, become apparent when in the space alongside the static performance. Like Brecht’s theatre, which suggested that a play should provoke rational self-reflection and critique rather than an emotional connection or even identification with the characters, the artist considers her work to be a catalyst for social and political change. Upon entering the gallery, the audience is subtly invited to become a participant, rather than a mere observer. 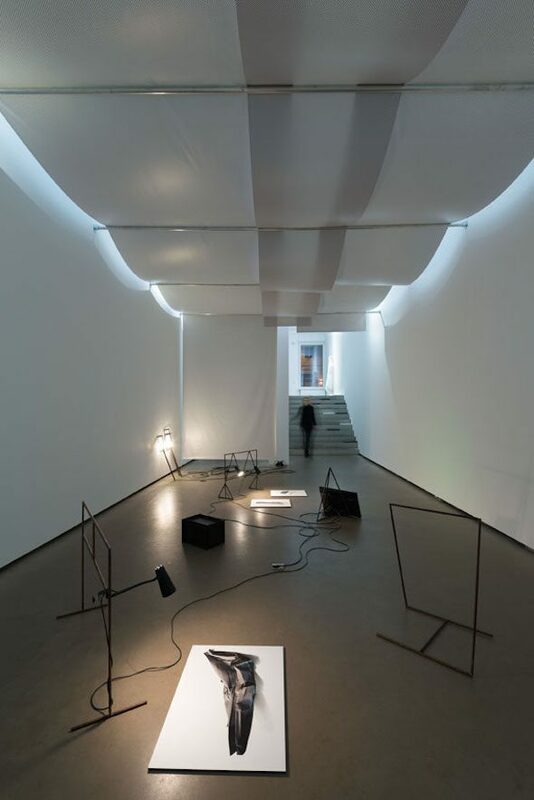 There is a dress-like piece made out of white army camouflage material hanging on the wall which, like the rest of the exhibition – the metal objects, the lamps, the edited photos and the video on loop – becomes a prop in a play that visitors enter and suddenly star in, without realising. As an artist from the Ukraine, who works, travels and exhibits regularly across Europe, Nakonechna touches on themes of migration, border crossing and conflict in her work, especially as they relate to her own life and history. 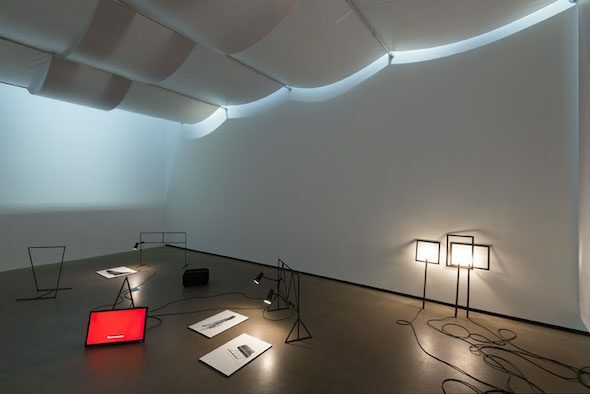 Besides her camouflage reference, these themes, though entirely unintentionally, also became part of her show in a different way, in the shape of a small black box that holds a sound, a sort of vibration. The original piece, however, never made it past customs at the airport in Germany. In light of the exhibition’s title, the audience can’t be sure at what stage they are entering the performance when observing it. Has it started, has it finished or is it paused? The photos are of objects, cropped from larger ones and stuck to metal palettes, displayed and laid out on the floor. One of them shows a piece of crushed metal, but the rest of the photo that would offer context is missing, the artist simply added some pencil drawings. The highly adaptable metal stands, of different shapes and sizes, have lamps attached that shine a spotlight on the objects. The artist calls them ‘helpers’, a positive connotation in most contexts. But a more critical, perhaps even slightly cynical eye could consider these helpers too influential in how the work is seen, where the light is cast, where the shadow falls, or where they perhaps trick an ordinary pair of eyes. Three simple lamp constructions lean on one of the walls: small square frames with a stick at the end and a light bulb in the middle. Here, again, the exhibition turns participatory. They are Nakonechna’s interpretation of the popular phenomenon that is the selfie stick. It is perhaps the most obvious push for the audience to self-reflect on society, as well as particularly personal habits, as the underlying message of this work becomes obvious very quickly; holding up one of her ‘selfie sticks’, you see nothing as the light is too blinding. Nakonechna has also included a piece of video installation in her show, playing strongly with the perception of reality on film. Origin and environment are strong influences, on artists especially, yet of course manifesting in different ways with each individual. Nakonechna is no exception. Currently living in Kiev, the national and international developments in and involving her homeland have influenced her work greatly. The show is at an almost uncomfortable stage, a weirdly intimate conversation between exhibited work and audience. It does not lead and it does not suggest, but leaves the reaction and level of involvement up to the viewer and, if successful, manages to connect on a highly personal level, causing visitors to reflect on their own history and identity within society.